Critics of wind energy often charge that wind energy is too "unreliable" to generate a large portion of a nation's electricity and suggest that base load needs "reliable" sources of generation such as nuclear power. While wind is a "variable" resource, that is, the wind doesn't always blow and when it does it doesn't always blow at the same strength, wind is far more reliable than the critics charge. In fact, wind is fairly predictable on long time horizons, especially from one year to the next. In contrast, nuclear power is "reliable" until it isn't as the units at the Fukushima nuclear power plant so dramatically demonstrate. The nuclear disaster still unfolding in Japan isn't the first time the Fukushima plants have been in the news. They were at the center of the Tokyo Electric Power (TEPCO) documentation scandal mid decade. Several of the reactors were shut down from 2002 to 2005 for safety inspections as a result of TEPCO's falsification of inspection and repair reports. 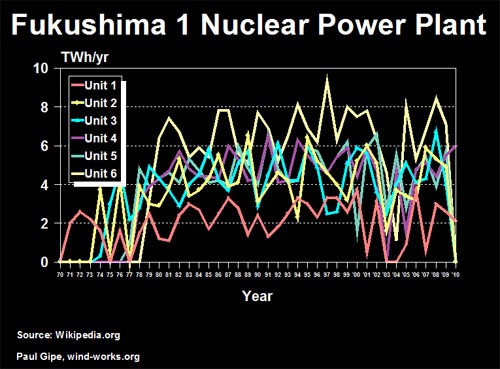 The Fukushima 1 plants generated, on average, 30 TWh per year. The key word here is "on average". Despite nuclear power's reputation as reliable base load generation, the Fukushima plants were anything but reliable over the four decades that the plants were in operation. Annual generation was surprisingly erratic or "lumpy" in the jargon of the trade. Take Unit 6, the most modern unit, for example. In 2004 generation dropped from 4.6 TWh in 2003 to 1.1 TWh, and both were a far cry from the reported generation in 1997 of more than 9 TWh. That's a lot of generation offline for even a big system like that in Japan that requires 1,000 TWh per year. Similarly, Unit 5's generation fell from 6.2 TWh in 1999 to 1.6 TWh in 2000. But not just generation from individual units varied significantly from one-year to the next. Combined generation from Fukushima 1 also fluctuated from one year to the next. The safety shutdown at Fukushima 1 cut generation by two-thirds or nearly 20 TWh from 2002 to 2003. Generation didn't return to normal levels until as late as 2007. German wind energy generation, on the other hand, has been far more stable from one year to the next than Fukushima 1. Throughout the last two decades more and more wind generation has been added to the German electrical system. 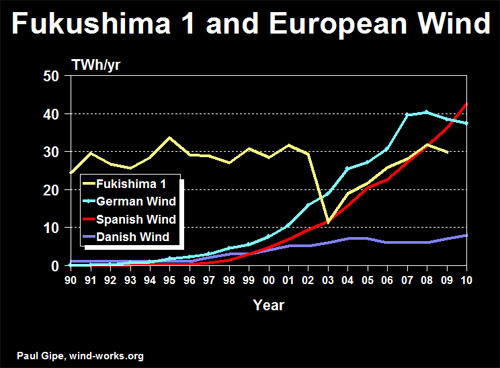 Today, German wind turbines generate as much electricity as the entire Fukushima 1 complex at its peak. Moreover, it is highly unlikely that an accident at one wind turbine in Germany will affect the more than 20,000 turbines operating across the breadth of the country. The loss of one wind farm with tens or even hundreds of turbines will likewise have little effect on overall wind generation in Germany. And German wind generation is expected to continue growing for the next decade at least. Unfortunately, all six reactors at Fukushima 1 are down permanently with a loss of 30 TWh per year of generation or nearly 3% of Japan's supply. The loss of generation from the reactors is not the only cost of the disaster. TEPCO's stock has lost 80% of its value since the multi-reactor meltdowns and it is unlikely to survive without a government rescue. TEPCO is a big player in Japan. They account for nearly one-third of the Japanese electricity market. Today it would be hard to imagine any Japanese electric utility "betting the company" on building new nuclear reactors. This is the heart of the debate in Japan. What generation should be added in the short-term to get through today's crisis, and what should be built for the long-term to avoid such dependence on "lumpy" generating resources as nuclear.